Many people associate Bali with a spiritual awakening; a place to look within your heart and soul, and it is easy to see why. 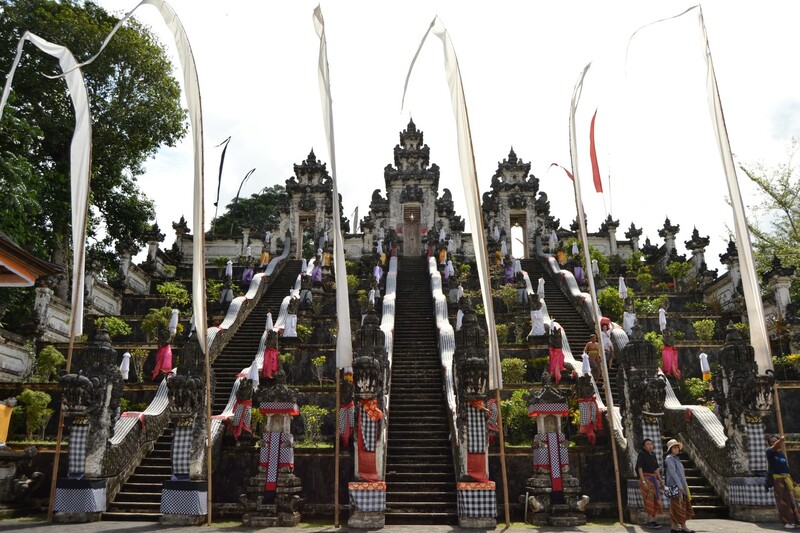 Bali as a whole is so beautiful that it is easy to get in touch with your inner peace and self. 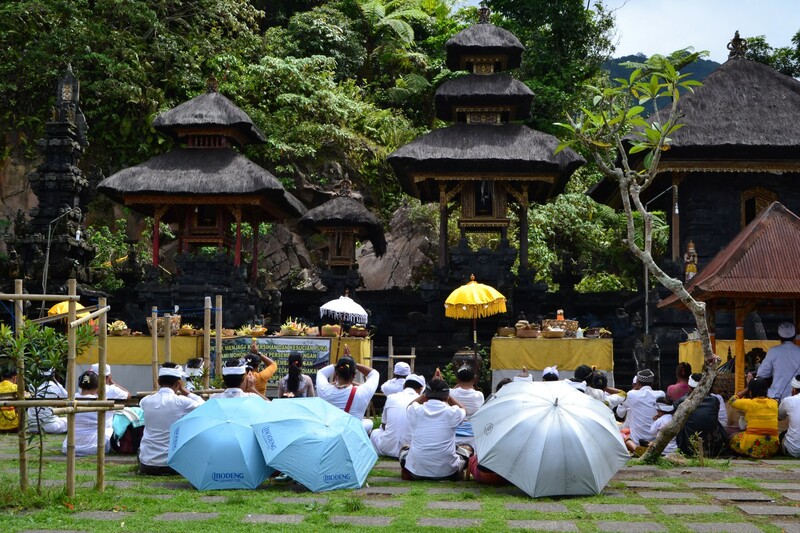 Maybe that is why the native people of Bali set so many beautiful Hindu temples in some of the most magical settings. One such temple is Lempuyang , which is just a mere 1720 steps (one way), not including sections that weren’t stairs, up a mountain. 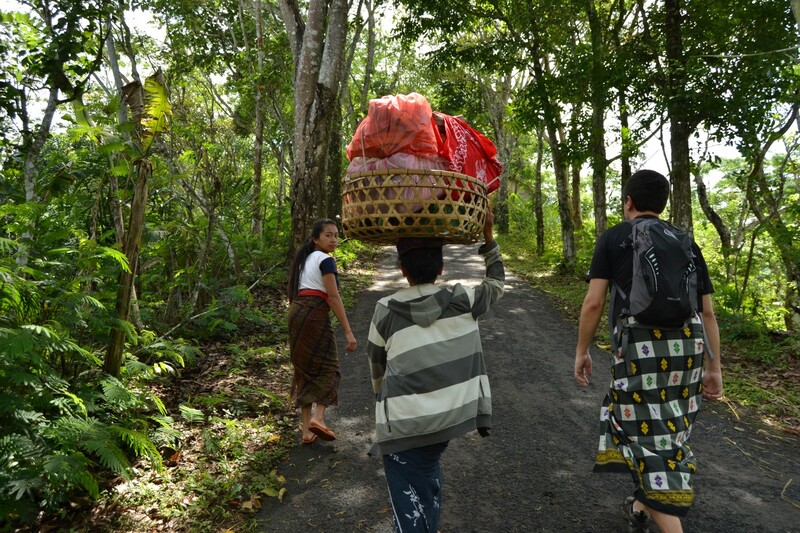 It’s a tough hike, so read my Tips on Lempuyang Temple to make sure you have a good experience. Now, I would consider myself in decent shape. I work out regularly, love to hike and enjoy taking on physical challenges. 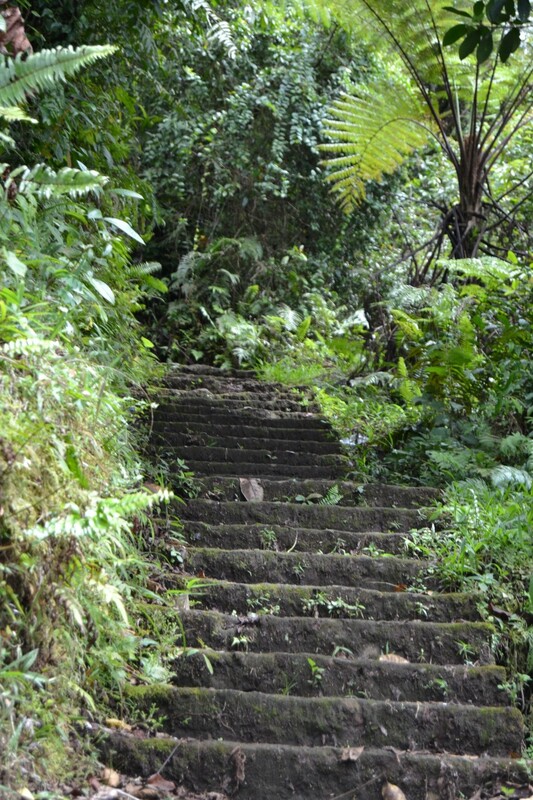 I had heard that this trek up to the mountain temple wouldn’t be a walk in the park, but I also didn’t realize how much I apparently hate steps. Upon arriving at the temple, we were greeted by the ticket office saying we had to wear sarongs through the whole trek, not just at the temples. They also advised us that there were “terribly dangerous and aggressive monkeys” and that they “feared for us” trying to hike alone. Coming from India, where everything is about getting a buck, we politely declined the guide, but had no way of side-stepping the sarong issue. That was fine, as they were only $1 each anyway. What was strange though, was the guide didn’t seem like a scammer. He legitimately seemed nervous for us and these supposed raging monkeys. We finally talked him down to a walking guide (someone who was just simply there to walk with us, but have no explanations) for $10. As we started our ascent, our 20 year old tiny female guide walked in the 90 degree weather plus humidity up the hills as if she was going for a leisurely stroll. It didn’t take long before we hit the steps. From there on up, it was basically climbing a decrepit staircase up the side of the mountain. The first temple came as a welcome relief to stop for a few minutes, take a few breaths and absorb the beauty. The first temple really wasn’t too difficult of a walk so far, so it wasn’t entirely surprising to see a few other tourists as well as worshippers making offerings of various degrees. Some would set money at the altar, others whole, roasted chickens all in hopes of pleasing the deities. As we continued along, I saw the benefit of a guide. There really are no signs saying where to go, but she knew just the way. And then came the monkeys. We had encountered monkeys up close in many places such as Spain and Africa and never had a problem, so how harmful can some apes be, right? WRONG. 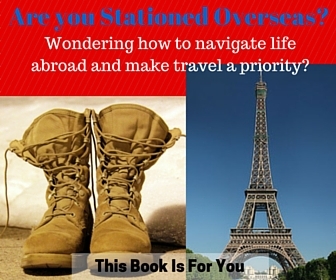 The initial guide wasn’t trying to scam us. As we passed an armed man, gun slung across his lap, we asked our guide why there would be an armed man in such a peaceful setting? “Poacher.” Was her brief response. 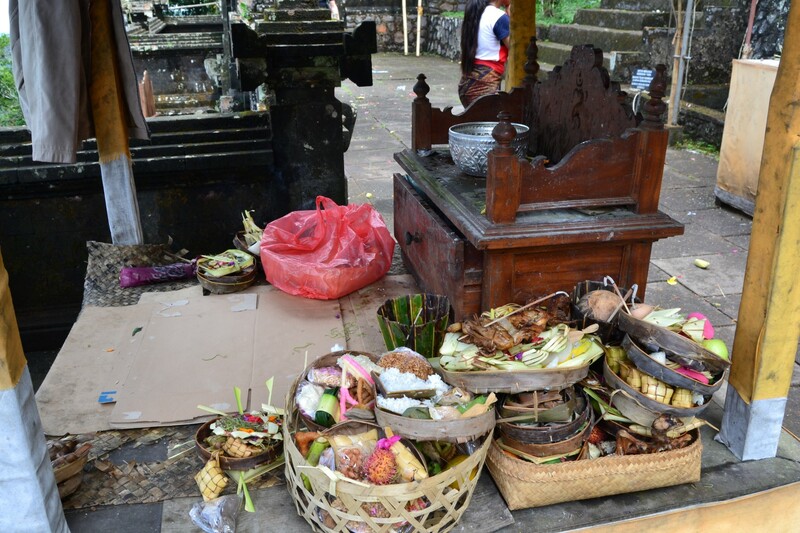 This is pretty serious seeing that the Balinese people are extremely religious and a part of Hindu is the respect of animals; the monkey being one of the most sacred. Suddenly, our young guide told us to stop. She listened carefully and saw some monkeys eyeing us from some trees. She, extremely seriously, told us get in a line, be very quiet, do not make sudden moves and absolutely no photography (holding up an object may be misunderstood as holding food). We inched along and each time she thought we were too close for comfort, she stomped her stick and yelled something in Balinese. We made it through the pass just fine, no rabid monkey attacks to tell of. As we climbed up for the next two hours, we encountered a total of seven temples, each with people holding small services. The most amazing was the last few where there was a celebration of sorts going on. A group of worshippers together went temple to temple, ringing bells, cleansing themselves with water, putting rice on their forehead (instead of a typical Hindu yellow or red dot; a symbol of the sixth chakra: wisdom). 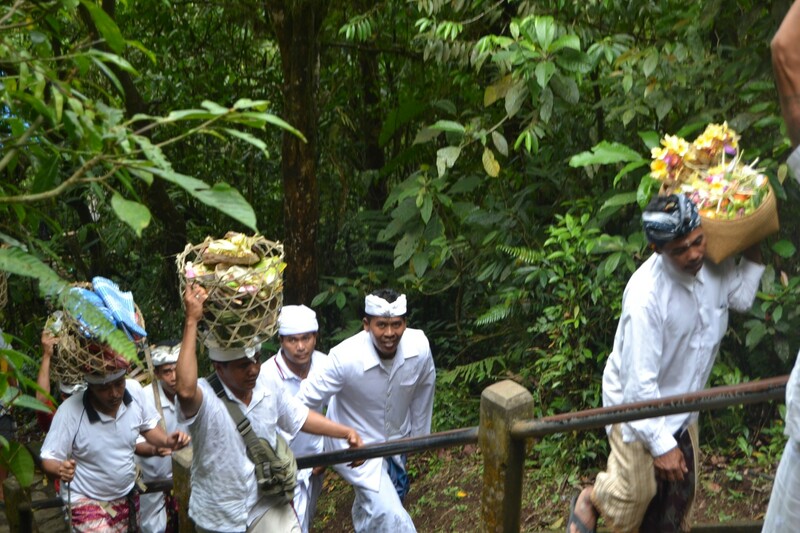 Each service was similar, but they hiked on to each individual temple. It was simply amazing at the amount of people that willingingly had chosen to hike three hours up a mountain in bare feet or flip flops just to give an offering of rice. I would sit at the entrance of the open aired temples absolutely mesmerized by their rituals. Although the mountain was now shrouded in cloud and you couldn’t see much, it was a beautiful and spiritual site at the top. On the way down, we got our first glimpse of the Balinese friendliness. A group of Balinese women were coming down alongside us. With their extremely limited English, they attempted a sincere conversation with us, all the while laughing, smiling and occasionally speaking amongst themselves. With the humidity, the stones and steps were extremely slick and as I lost my footings a few times, they would laugh and yell, “Slowly!” As I slipped yet again, an older lady just quietly grabbed my hand, patted it and walked with me. As I looked down, I wondered how she could walk four hours in uneven ground and broken stairs with nothing more than worn out, bright orange flip flops. It was about at this moment when she shrieked and dropped my hand. I looked up to see more monkeys swaying in the trees above us. It was at this moment that I knew we hadn’t been scammed into a guide. After all, if ALL the locals didn’t even like these monkeys, then I knew it wasn’t a con. A few laughed and pressed to the side of the trail as they ran as fast as possible past any potential threatening monkeys. I kept my camera at my side as to not give off any wrong impressions and clicked the button. Our guide whipped around at the sound of the shutter and firmly said again, “NO CAMERA.” Yikes. These monkeys are not monkeying around!!! As we neared our starting point 4 hours later, legs jello from the over 3000 stairs we had just climbed up and down, we wondered how our young guide can do this twice a day. As if the mountain knew we were finished, the first drops of a rain downpour began to slowly spit at us until finally, the clouds opened up, signaling our finish just as we closed the car doors.